Today’s most competitive companies use SuperForecasting based on data science to provide their teams with dynamic and actionable insights. Learn how sales & sales ops teams from companies like Nutanix, RingCentral, Pandora and TriNet revolutionized their sales capabilities and navigated dramatic change in their business. Plus, you'll leave with the recommended steps to make it happen in your organization. Aviso is announcing several new AI solutions that improve win rates and lead to more closed deals. Watch this webinar to learn how our customers are leveraging our 90% accurate AI-powered Win Scores and Insights to take control of pipeline and drive more revenue and better, more predictable outcomes. Nancy Nardin and Michael Lock discuss top myths that derail modern sales organizations. Learn how LogRhythm, a first-generation AI security solution, leveraged machine learning to simplify and improve forecasting across their hardware and software business. Join Arthur Velasquez, VP of Sales Enablement and Global Customer Relations, in a fireside chat with Michael Lock, CEO of Aviso, on May 10 at 9a for actionable takeaways on how LogRhythm expanded to serve over 2,000 customers globally and accelerated sales growth with Artificial Intelligence. Attendees will learn how LogRhythm accurately forecasts across multiple sales and revenue types, and drives team alignment globally for Friday and Monday forecasting calls, with a single, collaborative platform. In the age of big data, Sales Operations has emerged as a strategic ally to the sales team. Still, only 15% of companies have adopted data-driven best practices, and most B2B technology companies struggle with how to fully leverage machine learning and AI to provide actionable sales insights and intelligence. Sales forecasting is experiencing an AI disruption that's nothing short of epic. As the first to introduce this technology into the organization, Sales Ops is ushering in something big. Find out how you can leverage AI to improve sales forecasting and eliminate errors caused by spreadsheets, and how early adopters at technology companies obtain an accurate forecast on day 1 of Q, predict run rate business, and gain business visibility and actionable AI-powered insights that immediately improve sales. Sales operations leaders from two of the fastest growing companies, Splunk and Talend, have teamed up to share their secrets on how they're scaling sales processes, improving sales performance and growing at rapid speeds using "SuperForecasting" methodology. Learn from these early adopters on the technologies they are embracing to drive better results. There's no question that sales forecasts are often wildly inaccurate. So what are you doing about it? Hear Rickie Goyal, Sr. Director of WW Sales Operations at Nutanix, talk about the 5 critical questions he asked himself. Learn how the answers transformed his forecasting process, resulting in consistently forecasting within 5% of their actuals. Do you spend your Sundays manually consolidating, tweaking and fixing your sales forecast? So did the VP of Sales Operations at Zuora, until he found a forecast management platform that changed everything. Join Ben Kwon, as he talks about how to effectively manage a forecast and exceed plan even with a constantly evolving sales process and team. Join Apttus’s VP of Sales Operations, Ankur Ahlowalia, as he reveals his secret sauce for creating a successful forecasting process that has helped Apttus consistently exceed sales goals. 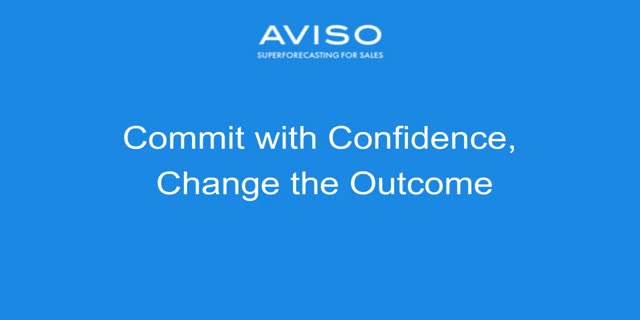 Aviso delivers a data science driven platform that helps sales leaders optimize performance and make smarter decisions to exceed sales goals.